This is not your sweet sparkling vampire story. Old-school vampires have re-surfaced, responsible for brutal murders and more blood than anyone can cope with. 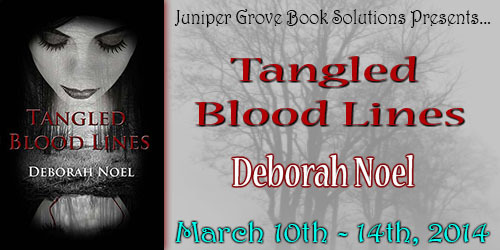 In “Tangled Blood Lines”, Cianna Fitzgerald, a young but “retired” crime scene investigator, finds herself back in a world she walked away from years ago. She grew up in twentieth century Pennsylvania countryside knowing she possesses superhuman powers from her “Irish pixie” bloodlines. She had retired after a particularly tough case where the victim was her husband’s twin brother. After her brief respite from murders and homicides, Cianna witnesses a killing where the murderer is a vampire. Her daughter goes missing soon after the killing. Cianna and the love she ahd once pushed out of her life, her estranged husband Declan, travel halfway around the world to try to save their child. As the mystery unravels, she learns that although she is a half-breed, the other half isn’t ”Irish pixie” as she grew up believing – weaving her into a more tangled history and frightening future than she had bargained for. I walked up the steps and into the cramped room. I no sooner had both feet in the door when my bladder let me know it was full, in no uncertain terms. I needed to go – NOW – and I had only been on the scene for three seconds. Figures. No time, I told myself. There is work to be done. I wasn’t able to concentrate. I couldn’t wrap my mind around the work to be done. I tried to figure out why. I knew. It was my way of procrastinating. Back to the job at hand. Focus. I looked around. It was dark. I could hear the humming of the generator as it powered up the lights. The sight before my eyes was almost indescribable. I took a moment to gather myself. I had to get myself into my character, so to speak. I pulled out my notebook to keep notes of what I saw. But it was too loud around me. I needed everyone to clear from inside this tiny room. Too much distraction, too many moving things walking around and trying to keep their stomachs where they belonged and not add to the mix of already putrid things on the floor. “Everyone needs to clear out for a spell. I need to be alone with the scene to process it. Please, give me five.” I yelled out. There were no arguments. Quicker than the urge to pee had hit me when I arrived, I was alone. I closed my eyes and took a deep breath. My nasal passages were swamped with smells of death, rot, mold and a few other things I couldn’t quite identify. I slowly opened my eyes. It was only as the blurry visions came into focus that I was able to see the truly horrible scene. Blood was everywhere, and I mean everywhere. On the floors, the walls, the chairs, the table, the sink, the stove, the refrigerator and even on the ceiling. There were dead rats, cats, and pieces of animal legs scattered around. There were nooses hanging from the exposed beams and meat hooks as well. Rabbits and squirrels hung from some of them. “This gives a new meaning to a work-from-home slaughterhouse,” I said to myself. I pushed the notebook into my kit. There just weren’t any words. I grabbed the camera hanging from my neck and began to focus the lens. I snapped pictures of everything. In the corner was a small closed door. I made my way to it. With great effort I pulled it open and stepped inside. I wish I hadn’t. The first thing I noticed was there was much more light in this room than the last. It was so bright, in fact, that it took a few seconds for my eyes to re-focus. When they did, I knew that the extra lighting was for effect. 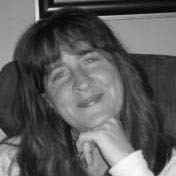 Born and raised in North Eastern Pennsylvania, i fell in love with writing at the age of 12. I have written plays, short stories and poetry. Married at sunset on Hawii’s Maui Island. I am still residing in Pennsylvania with my husband Herb and our Jack Russell Terrier, Rocket. 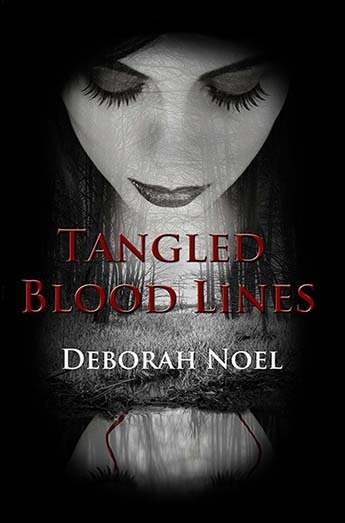 While our demolition business slowed down in the year 2009 Herb encouraged me to follow my novel-writing dream and Tangled Blood Lines is the result.